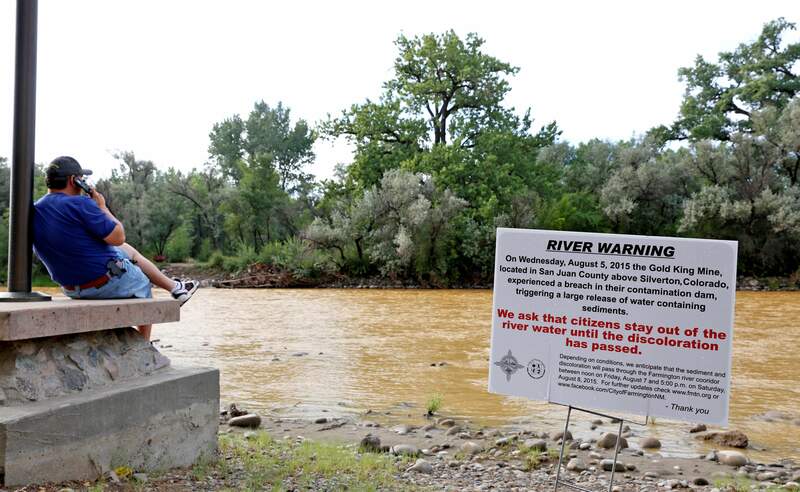 A warning sign from the city is displayed in front of the Animas River in August 2015 as orange sludge from a mine spill upstream flows past Berg Park in Farmington, New Mexico. On Monday, the U.S. Supreme Court denied New Mexico’s petition to hold the state of Colorado responsible for the spill. New Mexico’s petition to hold Colorado responsible for the Gold King Mine spill nearly two years ago was denied Monday by the U.S. Supreme Court. “Because it was the EPA and not Colorado that caused the Gold King Mine disaster, I have said from the beginning that New Mexico should not have sued Colorado in the Supreme Court,” Colorado Attorney General Cynthia Coffman said in a prepared statement. In August 2015, an EPA-contracted crew breached the portal of the historic Gold King Mine, releasing an estimated three million gallons of mine wastewater down the Animas and San Juan rivers. Last June, the state of New Mexico sought damages and demands from Colorado for its part in the mine spill, as well as the decades of toxic drainage from mines at the headwaters of the Animas River near Silverton. The complaint specifically called out a decision reached by the state of Colorado and Sunnyside Gold Corp. to shut down a water treatment plant in favor of placing bulkheads at the entrance of the American Tunnel, Sunnyside’s drainage point. It’s believed among most researchers familiar with the Animas watershed that the bulkheads caused the mine pool of the Sunnyside Mine to back up and cause other mines to discharge acidic water, namely the Gold King. “It’s unclear to me how suing Colorado furthers the states’ mutual goal of holding the EPA to its promise to ‘take full responsibility’ for turning our rivers yellow,” she said. The U.S. Supreme Court on Monday, its last day in session this term, declined to hear arguments in New Mexico’s case and did not offer an explanation on the decision. Justices Samuel Alito and Clarence Thomas, however, said they would let the motion move forward. “The Supreme Court’s ruling only limited the venue in which the State of Colorado can be sued for the harm done to New Mexico children, families and businesses,” James Hallinan, spokesman for New Mexico Attorney General Hector Balderas, said in an emailed statement. The Supreme Court’s decision to dismiss New Mexico’s petition is the latest lawsuit to fail in the long line of litigation in the wake of the spill. To date, the EPA has spent more than $29 million in response to the Gold King Mine spill, with most of those funds used to stabilize the mine adit and mitigate ongoing acid mine drainage through a temporary water treatment plant, Amy Graham, an agency spokeswoman said Monday. A total of $3.7 million has been awarded to state, tribal and local governments for emergency response costs, and another $2 million was provided to states and tribes for water quality monitoring, Graham said.